We all know that planning a trip to visit Santa is a big thing and that trawling the internet to carry out research can take a long time. Travelling with Santa’s Lapland takes the stress out of the planning. In addition to the guaranteed Private Family Meeting with the man himself – Santa Claus, here are 6 fun activities always included in our trips to make your Santa trip special. Mums, Dads and Grandparents all get a go at driving the husky sled, after meeting the huskies. 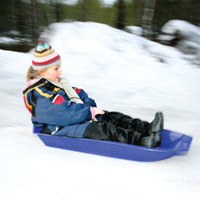 Children get to sit back and enjoy the ride onboard the sled as it whooshes along the snow. With the husky’s full of excitement, they just want to run and have fun. Meet some of Rudolph’s reindeer friends and enjoy silently swishing through the trees of Saariselkä forest on your reindeer sleigh ride. Santa’s team of Christmas Eve reindeer led by Rudolf will be busy training in December; his friends always enjoy taking visitors to Lapland for a sleigh ride in the snow. Most children enjoy loud noises and going fast, children can ride time after time on these mini skidoos specially designed to be safe for youngsters. There is so much fun and excitement when children take the opportunity to try something different. 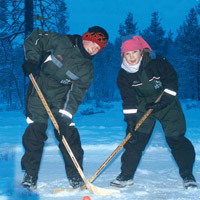 Challenge Santa’s helpers to a game of ice hockey and see who can become the snow champions. Santa’s team of helpers play snow hockey as much as they can when they get time and would love the challenge of playing against a visiting family or two.